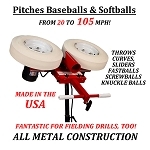 There's no need to wait until you have someone to feed your First Pitch pitching machine balls when you have a First Pitch Auto Ball Feeder. Great for both hitting and fielding practice, the auto feeder will continually throw, pausing briefly between each toss. 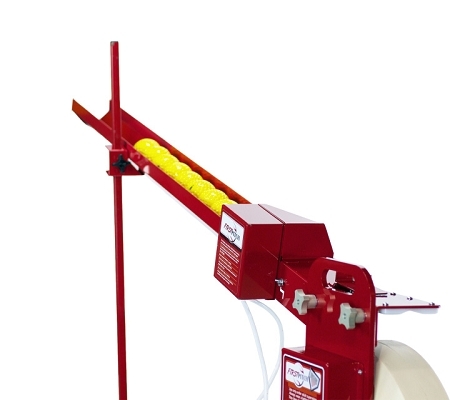 The First Pitch Auto Feeder holds up to 16 real or dimple baseballs or 12 real or dimple softballs (11 inch or 12 inch). 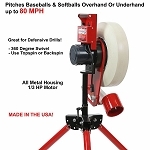 Super durable, it sets up easily with no tools and fits all First Pitch pitching machines EXCEPT the First Pitch Relief Pitcher pitching machine. Made in the USA, the First Pitch Auto Ball Feeder features a full 2 year manufacturer's warranty and 14-day satisfaction guarantee, too! Feeds balls automatically - great for solo training! Q: Is this feeder compatible with pitching machine Part# 713651406052? 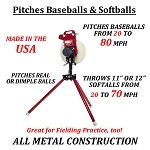 A: Model #713651406052 is the First Pitch XL pitching machine, so yes, the First Pitch Automatic Ball Feeder works with it. PLEASE NOTE: Because it uses a different type of tire than the other First Pitch machines, this auto ball feeder WILL NOT work with a First Pitch Relief Pitcher pitching machine. To ensure your satisfaction, the First Pitch Auto Ball Feeder includes a 14 Day Money Back Satisfaction Guarantee. Returned items must be in good, resellable, "like new" condition with original packaging. Unless returning an item that is defective, customers are responsible for the return shipping costs to First Pitch as well as the original actual shipping costs, whether they obtained "free" shipping or not. There is also a 10% restocking fee on all returned items. First Pitch warrants the operability of your Auto Ball Feeder for 2 full years for residential use or for 1 full year for commercial use from the date of purchase. This warranty covers all mechanical and electrical parts against premature wear or failure, electrical malfunction, or accidental damage during reasonable normal use. For complete details about this website's policies please see our Shipping, Returns and Warranties page. 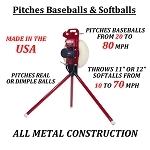 No matter where you order a First Pitch Automatic Ball Feeder from, NOBODY actually stocks them; they all ship directly from the manufacturer's warehouse located in Maple Plain, Minnesota. Therefore, the shipping time frame is exactly the same no matter what website you order from (we hope that it is this one!). First Pitch Automatic Ball Feeders typically take 2-4 business days to ship from the time you place your order. They ship via Federal Express (FedEx) Ground and could take anywhere from a day or two to a week to get to you AFTER being shipped, depending on your proximity to their warehouse. We will notify you of your tracking number the moment we receive it from the manufacturer's warehouse. 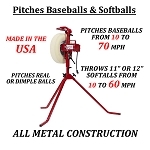 Click here to download an easy to read, printable PDF of the First Pitch Auto Ball Feeder Instructions.